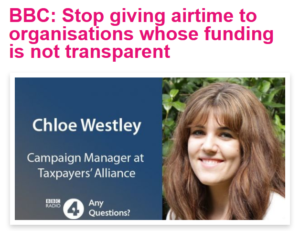 In the wake of revelations that right-wing think tank, the Institute for Economic Affairs (IEA), offered potential US donors “cash for access” to Conservative ministers, Molly has launched a petition calling on the BBC to stop giving airtime to organisations whose funding is not transparent. The IEA has repeatedly received the lowest transparency rating by campaign group Who Funds You? but has regularly been offered a platform by the BBC. Investigations by Open Democracy reveal that funding sources for the IEA include US tobacco firms seeking to avoid tighter regulation and the Templeton Foundation, which lobby for health care privatisation. However, the IEA is just one of a series of organisations which are accused of lacking transparency in their funding; organisations collated recently for the Brexit Syndicate website. “Through this petition we demand that the BBC no longer gives airtime to fake think-tanks and so-called charities peddling their right-wing propaganda when they lack transparency about how they are funded. “There are also worrying connections between these dodgy organisations and Brexit. Last week Private Eye revealed that the Department for Existing the EU has held more meetings with the IEA than it has with the UK car industry. Another odious example is the ‘Taxpayers Alliance’ which argues strongly for the privatisation of the health service. Chloe Westley, who is campaign manager at the Taxpayers Alliance, oversaw social media for Vote Leave. She is frequently to be found spouting the views of her paymasters on a range of BBC outlets.